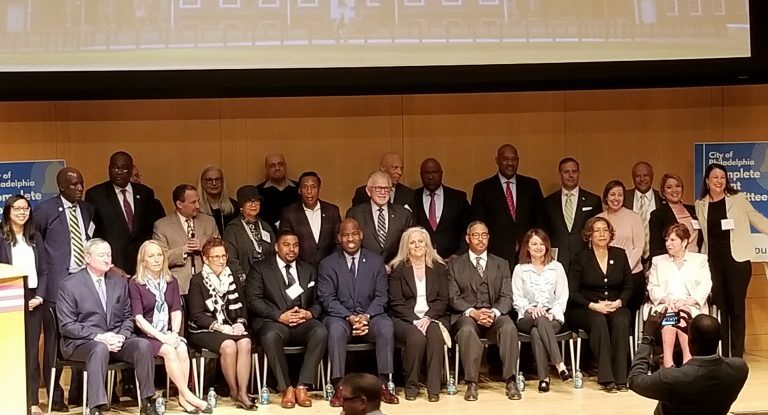 A call for an accurate census count reverberated through America’s most historic square mile Monday morning at a National Constitutional Center gathering that included Philadelphia politicians, religious leaders and students. The census count dictates everything from what states lose a spot in Congress to federal funding, said U.S. Rep. Dwight Evans. The Rev. Alyn Waller, senior pastor of the Enon Tabernacle Baptist Church, encouraged everyone to participate. “This census is about fighting for the soul of our democracy, it’s about saying who lives in America, and who counts in America,” he said. An accurate headcount is crucial to the flow of money to support Philadelphia, said city Councilman Derek Green. “We had a major initiative to bring Amazon to Philadelphia, this committee is representative of that same type of energy,” he said. Later Monday, Pennsylvania officials in Harrisburg echoed that commitment to help the federal government count everyone. Although preparation for the once-a-decade process is already well underway, there is still a major unknown element officials must contend with: Whether they’ll have to ask people if they’re citizens. State officials say it is particularly hard to get accurate counts of the poor and minority groups that often need services most. Penn State Data Center Director Sue Copella, who works closely with U.S. census officials, said every uncounted Pennsylvanian amounts to a loss of about $2,093 over 10 years. “If you lose 10 people in your community, it turns into a lot of money that community will lose,” she said. Reaching out to all corners of Pa.
Democratic Gov. Tom Wolf’s administration has a commission aimed at figuring out how to get responses from people who, for instance, live in remote areas, are homeless, or don’t speak much English. The census form itself will also include a number of changes aimed at addressing that. For the first time, respondents will be able to fill out the survey online. Plus, state officials said about eight new languages will be available. But they noted, they are concerned another proposed change might dampen responses. The Trump administration wants to use the census to ask people if they’re citizens. Rick Vilello, a deputy secretary with the Community and Economic Development Department, said he’s concerned that including the question will make people afraid to send back their responses. Federal funding formulas, he said, don’t rely on citizenship status. On Twitter, President Donald Trump said doing a census without a citizenship question would be “meaningless” and a waste of money. The U.S. Supreme Court is considering the question, and it is expected to decide before surveys have to be printed this summer. Along with the Wolf administration’s census commission, Pennsylvania is home to Keystone Counts — an independent assemblage of groups doing their own work to bring the census to hard-to-reach communities.